The Rock Climbing Company offers a full range of rock climbing courses, holidays and instruction in both the UK and Spain. We specialise in creating courses that combine a low instructor ratio with completely personalised climbing instruction. Our adventure activities are mainly based in Snowdonia in North Wales and the Malaga and Granada areas of southern Spain. Our outdoor activity courses cover both the skills needed for rock climbing as well those needed for mountain navigation and rock scrambling. We can deliver this instruction at all levels of ability and experience from absolute beginner upwards. 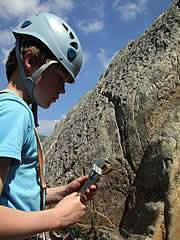 Our clients range from families who want a safe, exciting rock climbing taster to more experienced climbers who want to learn to climb outside or who want to start lead climbing. We try hard to provide great courses and have an international clientele from three continents. There is a short collection of testimonials at the bottom of the page. The majority of our courses are arranged privately and this way we can build a course to your exact requirements - if you are thinking about a rock climbing or mountain skills course then just contact us with details of what you want to do, what you would like to take away from the course and your time scales. We'll get straight back to you with ideas on how we could help. We run our courses in Snowdonia in North Wales and Andalucia in Southern Spain because these are great mountain areas that we know really well and this local knowledge helps us to build personalised courses on routes and terrain that matches your ability and aspirations whilst also letting us get the most out of the conditions. Courses run throughout the year in both Snowdonia in North Wales and Andalucia in Southern Spain. These are both great mountain areas that we know really well and it is this local knowledge that helps us to build personalised courses on routes and terrain that matches your ability and aspirations whilst also getting the most out of the weather conditions. 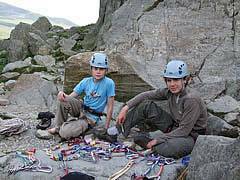 The climbing and mountaineering instruction in North Wales is normally based close to the towns of Betws-y-Coed and Llanberis in the Snowdonia National Park. This is a brilliant mountain area with a variety of climbing that is unrivalled in Britain - there are long, classic mountain routes in the Llanberis Pass and Ogwen Valley, adventurous sea cliffs at Gogarth, roadside crags at Tremadog and sports climbing on the bolted coastal limestone near Llandudno and Conwy. 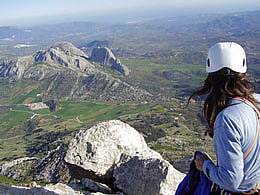 The climbing holidays and mountain activity courses in Spain are based in the hills that lie between Malaga and Granada and we have easy access to the excellent areas of El Chorro, Torcal, Loja, Archidona and the mountains of the Sierra Nevada. Our base is at 900m and this lets us choose between a cool mountain climate and the warmer coastal conditions depending on the weather and the time of year. The area behind our base has a full variety of sport and traditional climbing plus plenty of scrambling. The variety in these two areas has a lot of advantages as it allows us to teach a comprehensive range of techniques and lets you form a solid base of mountain skills to build on. We are a small company run by Silvia Fitzpatrick. 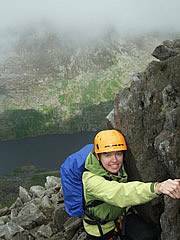 Silvia is a very experienced climber who holds the Mountain Instructor Award and is a full member of the Association of Mountaineering Instructors (AMI) and the Mountain Leaders Training Association. Silvia has climbed all over the world for over 25 years - highlights include climbing the North Face of the Eiger, the first female ascent of Cerro Fitzroy in Patagonia, becoming British Climbing Champion and being one of the few British female climbers to climb a route graded 8b. Silvia still runs many of the climbing courses herself together with help from a small team of fully qualified climbing and mountaineering instructors. 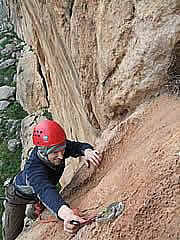 The instructors we use on our climbing courses are all active climbers we have known and worked with for a long time. We are all fully qualified to the appropriate level by the Mountain Leader Training board and are all fully insured. Silvia and the majority of the instructor team hold the Mountain Instructor Award along with a couple of SPA and MIC qualified instructors. The pages on this web site will, hopefully, outline the variety of activities that we can offer: however these are just guides and we are more than happy to build custom courses that meet your specific requirements. So if you are unsure which course is the most appropriate for you or if you have a specific agenda in mind that you do not see mentioned then please get in contact and we will put together a course for you. We have put together a climbing courses flow chart that might guide you towards the right pages. The rock climbing courses we offer range from exciting taster lessons that let you to try climbing and abseiling for the first time, through multi-day lead climbing courses to performance climbing clinics for experienced climbers looking to improve specific areas of their climbing. You will find some broad course outlines below, but these are really just a starting point because everyone is at a different stage in their climbing and has different needs. We will build the course around your requirements and arrange the instruction so that it moves at a comfortable pace and gives you the skills and experience that you want - all within the framework of an exciting and safe mountain adventure that will stay in your memory for a long time. 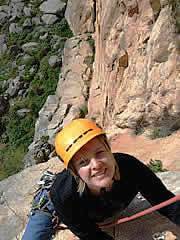 An outline of some popular rock climbing courses is set out below. 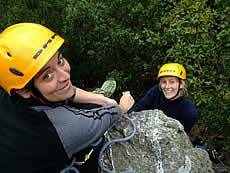 Climbing Taster Courses: A beginners course that will let you try climbing and abseiling - you will climb some fantastic routes and get a true feel for what rock climbing's all about. 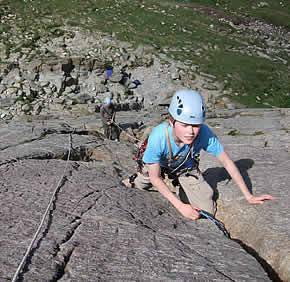 You will learn all the basic skills involved in climbing - using a harness, tying into the rope and belaying. A great course for families or corporate team building that can be run at an indoor climbing wall or on an outside crag . Learn to Climb Course: A comprehensive introduction to the sport of climbing that will give you the key skills and experience to start climbing independently and safely. We normally cover: Climbing equipment, tying onto the ropes, belaying, ropework, choosing anchors and building belays, movement skills and techniques, abseiling, understanding guidebooks / climbing grades and selecting routes. Plus we will do lots of climbing. We often start this course at an indoor climbing wall and then progress outside onto single pitch crags plus there is often the opportunity to second multi-pitch routes. Outdoor Climbing Course: This course is perfect for those climbers who have learnt to climb indoors at a climbing wall and now want to expand their skills to start climbing outdoors. The course covers topics such as setting up belays, rope work on single and double ropes, the crag environment, guidebooks plus climbing equipment and how to use it correctly. The great thing about being based in North Wales is that there are multi-pitch, sport and traditional routes all within easy reach of each other which lets us offer a really wide range of instruction. Lead Climbing Course: Learning to lead climb can be a stressful and intimidating step in your climbing career, but learning with an instructor will give you the opportunity to start leading at your own pace in a controlled and safe environment. We have a lot of experience in teaching people how to make the transition from top roping and seconding to leading both sports and traditional (trad) routes. People often find it reassuring to know that their climbing instructor will often be on a separate rope right alongside them as they make their first leads. Sea Cliff / Adventure Climbing Course: This course will give you the extra skills and confidence to overcome the extra objective difficulties that are likely to encountered when attempting sea cliff routes. 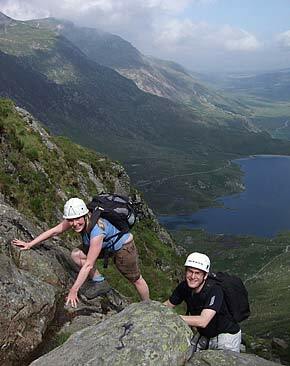 Guided Climbing : We can arrange guiding for virtually any route in North Wales and Snowdonia. We love climbing and there is nothing better than sharing the best routes in the area with fellow climbers - we can point you towards the very best classic rock climbs or help you climb the routes that you have always wished to do. It is really easy to combine guiding with instruction, so that you climb some great routes and learn a lot at the same time. Performance Climbing Courses : Virtually all climbers hit a plateau at some stage in their climbing life and pushing beyond this point is sometimes difficult without help from an experienced climber looking at the situation afresh. Silvia is great at getting you enthused, highlighting strengths and weaknesses and maximising your potential by getting you to climb intelligently. Advanced Rope Work and Self Rescue Techniques: Trouble happens. This course will help you avoid getting into trouble in the first place and also give you the core ropework skills to implement a rescue if you, your partner or another team get into trouble. The Rock Climbing Company offer a full range of mountain scrambling courses that can be based in the Snowdonia mountains of North Wales or in the Sierra Nevada / Alpujarra ranges of southern Spain. Mountain scrambles can cover a very broad range of terrain and difficulty within their length; some sections may not be much harder that steep walks, whilst others may need knowledge of alpine mountaineering and rock climbing techniques. The difficulty for the novice scrambler is knowing how to move fluidly and safely over all these differing types of terrain. Scrambling needs a multitude of skills, but I think the core ones are mountain sense, movement techniques and rope skills - of these learning the ropework needed for scrambling often feels the hardest, but practice does makes perfect and using an instructor will accelerate the process. An experienced mountaineering instructor will be able to teach you all these skills and will be able to show you how to proceed amongst the mountains safely, teaching you best practice and giving you the ability to tackle difficult ground safely. Scrambling in the mountains of Snowdonia and Spain is an ideal introduction to the world of mountaineering and the techniques learnt from a climbing instructor on a scrambling course will give you the skills and experience to explore the mountains of the UK with more independence and safety. Snowdon via Crib Goch : This is the classic Welsh scramble. The difficulties on the standard route are not excessive, but the exposure on the main knife edge ridge is mind blowing and unforgettable. The difficulty can be increased by taking variation approaches and the route can be extended to take in the whole of the Snowdon Horseshoe. If you are lucky enough to do the route on a clear day then the views are amazing. Scrambling - Welsh Classics: A tour of the best scrambles in Snowdonia. There are lots of great routes and the scrambles we choose will depend on the weather, fitness and experience but could include Cneifion Arete, Bristly Ridge and Tryfan via Milestone Buttress approach. The Tryfan / Bristly Ridge combination is a brilliant circuit for the fit that rivals Crib Goch. Learn to Scramble Course: A 2 to 5 day course that will cover all the essential skills needed to start scrambling. The course will try to strike a balance between teaching you technical skills needed whilst maintaining a strong emphasis on the careful judgments required for safe scrambling. We will look at basic rope work, moving over steep ground, short roping and route-finding / interpreting the guidebooks/grading system. Advanced Scrambling Course: This course is for those who have some scrambling experience and want to climb harder (Grade 3) scrambles. 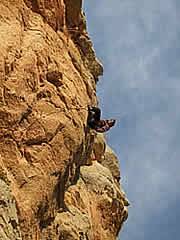 Grade 3 scrambles are essentially moderate rock climbs and so the course will look at more advanced rope work and movement techniques. We will also cover equipment selection, gear placement and navigation as well as escape/emergency techniques. We will, of course, also climb a lot of great routes. Guided Scrambling: There are lots of great scrambles, some of which are famous and some which are less well known. We can help you enjoy some fantastic scrambles in Snowdonia and Spain by guiding you to the very best routes and looking after all the safety and technical issues. This is also a great course if you have limited time and want to maximise the amount of scrambling you do or want to push your grade. The Rock Climbing Company offer a comprehensive range of flexible mountaineering courses that are always customised specifically to your requirements. We base our climbing instruction and guiding in two fantastic areas; between Spring to Autumn we run courses in Snowdonia, North Wales and during the Winter we offer climbing courses from a small town in southern Spain that lies in the hills between Malaga and Granada. We tend to keep our instruction to these two main areas because we know them well and this helps us deliver effective courses that get the most out of the available time and conditions. Why Use a Climbing Instructor? Climbing with a professional, qualified and fully insured instructor lets you learn new skills efficiently in an intensive and enthusiastic environment, knowing that you are being taught best practice in the safest possible manner. You’ll also gain personal confidence as you rapidly widen and deepen your whole spectrum of climbing skills through observation, practice and discussion. 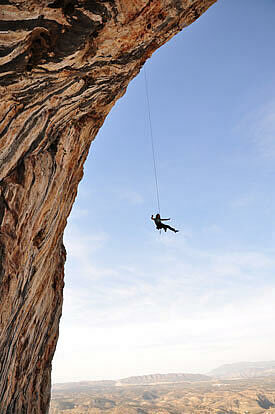 Importantly you will enjoy the local knowledge that a climbing instructor has acquired over many years. Bad weather? We won’t waste a day; we’ll just change objectives. Route too crowded? We’ll move over here; this route’s even better. Feeling pressed for time? Don’t worry, we know the shortcut home. All in all, your climbing experience will be improved with local knowledge, professional skills and enthusiasm for the adventure at hand. Instructor/client ratios are kept low to increase safety and maximise contact time for learning. It may be tempting to reduce costs by looking for higher ratios, but you don't learn as much and it is much more difficult to get the course fine tuned to your requirements. Maximum instructor-client ratios can be found in each course section. We run both private and open courses. Private courses are arranged with a single client or clients who want a specific course for themselves or for their party - private courses enable us to work with you to create unique courses that suit you. We only run the more advanced courses on a private basis because at this level your demands are likely to be quite specific. Open courses are courses that we arrange for specific days and people can enrol on them as required - we arrange our open courses into quite tight categories to ensure that we minimise the spread of abilities within a group. Our open climbing courses are a great method of getting into the sport and meeting other climbers. There is not much difference in prices between private courses and open courses. Prices can also be found in each course section. Taster sessions normally last between 0.5 and 2 days, whilst all other instruction can be any length from 1 to 5 days or more. Many clients find that there is a great benefit in having at least 2 days of instruction because it allows them reinforce all the newly learning skills whilst still allowing time to enjoy the adventure. We love climbing, scrambling and being in the mountains. We know the areas we teach in well and can help you climb your dream routes, whether it be a classic scramble in the Glyders or Right Wall on Dinas Cromlech. Guiding and instruction are easily combined, so if you would like to learn new skills whilst climbing classic routes then this can easily be arranged. We are a small, independent company run by Silvia Fitzpatrick and a lot of the instruction is delivered by Silvia. 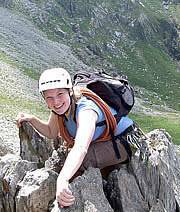 Silvia holds the Mountaineering Instructor Award and is a full member of both the Association of Mountaineering Instructors and Mountain Leader Training Association. In the event that Silvia is unable to personally instruct the course she may be able to offer an alternative instructor; all our associate instructors are professionally qualified to the relevant national qualification. In addition we only use instructors who we know and share our passion for the mountains. We will always ensure that the client is fully aware of the situation and that the use of an alternative instructor is acceptable to them. Instructor/client ratios are kept low to increase safety and maximise contact time for learning. Maximum instructor-client ratios can be found in each course section. Prices can be found on the panel to the side. The use of all technical equipment such as ropes, harnesses, karabiners and helmets. Travel to and from the course base or venue. Personal insurance (illness, accident, cancellation and personal equipment/possessions). Personal equipment such as waterproofs, walking boots and rucksack. Climbing shoes may be hired if required for the entry level rock climbing courses - just let us know your sizes in advance to ensure availability. All specialist equipment will be provided by the Rock Climbing Company. As detailed above you are responsible for providing your own suitable clothing, footwear and rucksack. Further detailed info can be found in the specific course sections and the main equipment section. Snowdonia has a wide range of venues to choose from and often it can be raining at one and sunny at another. 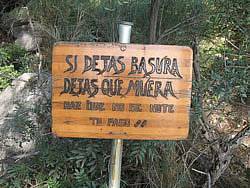 The same is true of Spain - it can be horrible in the mountains, but there will be blue skies over the coast at Malaga or it can be too hot on the coast and plains, but pleasantly cool in the mountains above Villanueva del Rosario. 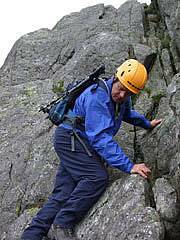 On rock climbing and scrambling courses we will always use our local knowledge to try to choose a venue best suited to the prevailing conditions, whilst for navigation courses poor weather can provide realistic conditions which will enhance the learning experience. We will do everything we can to make each day happen, so please arrive prepared for both warm and cold weather because you will be in the mountains. We will determine on each morning of the day or course if it has be canceled due to inclement weather causing conditions likely to endanger members of the course (extreme cold, torrential rain, or snow). If it is canceled, you may transfer to another course on an alternative date. All instruction is undertaken by professionally qualified instructors who all have many years of experience. The safety equipment we supply and use is of good quality, well maintained, in good condition and regularly inspected. We instruct and teach to guidelines set by the Association of Mountaineering Instructors. We instruct and teach in groups with low client to instructor ratios. We constantly evaluate risks throughout a course and if a level of risk is deemed unacceptable, then the activity will be altered accordingly. Activities will always be conducted in a manner compatible to your current level of experience and competency. All our courses involve physical activity and most are wholly suitable for anyone who is healthy and of average fitness. Our instructors will take your actual level of fitness into account and ensure the activities are conducted at a comfortable pace. If you do have a medical condition, please use the space provided in the Booking Form to let us know; it is important we know of any and all medical conditions or allergies that affect you because if anything does happen then we are likely to be in a remote area and your health and safety will be in the hands of your instructor. All of our instructors have a valid REC first aid certificate. What experience do I need ? Our courses cover the range of experience from the absolute beginner to those having substantial experience. Please check the course notes for your particular course for details. Do I require insurance ? We strongly recommend that you take out insurance to cover course cancellation or curtailment. This should also cover you for accidents or if you have to cancel due to reasons beyond your control such as illness. If you are a member of The BMC then you can take advantage of their insurance services via The BMC web site or the company Snowcard provide insurance for outdoor activities. You should book accommodation to suit your budget and preference be it hotel, B&B, bunkhouse or camping. Snowdonia has a host of options to choose from and you may wish to visit our accommodation pages for accommodation recommendations and suggestions. Client satisfaction is very important to us. It is one of the bonuses of running a small company that we regularly receive compliments from clients on the courses that we have run. Just wanted to say a big thank you for fitting me into your busy mad week. I really do appreciate it so much. I had the most amazing time, I loved the climbing days plus the crazy activities that you made me do! You made me feel so welcome. I thank you so much for everything. Please please do feel free to stay here with us in Scotland if you ever want to do some climbing here, or even if you just want a rest! Take it easy, I hope you have the most wonderful time climbing in Morocco and a quite day tomorrow. Dear Silvia. F.... and I would both like to thank you so much for the expert tuition on our recent rock climbing course with you. The course content exceeded our expectations in every respect. The amount of detail you imparted and the thoroughness of the safety elements was amazing. Although I may have been slightly tentative at times, it was thoroughly enjoyable from start to finish. The photos you took show me smiling a lot so it must have been good. We are delighted that we chose to come to Spain and to engage your services rather than find a course at home. I cannot believe we could have found anyone so enthusiastic and encouraging as you were. A quick email to say thank you for organising last week's course. Sam was a fantastic teacher, excellent company and truly inspiring. Thanks to her encouragement and confidence in me, I achieved much more than I thought possible in 3 days and I cannot wait to get out there and try out my newly acquired skills! just back from Wales. We had an exceptional time, and it has completely given me a new lease of life in the mountains. Thanks to Rory for superb leadership and instruction. ................ Thanks for providing us with a great experience. AS - Custom Scrambling + Navigation Course - April 2011. Firstly, thanks very much for organising it all for me. I certainly achieved my objective for the day and much more besides. Catrin was absolutely great and very professional with endless knowledge . But also she was a great teacher . Once she had assessed my ability on rock she cut me loose(no pun intended) but kept a close eye on me and made suggestions along the routes while I led. I feel much, much more confident regarding gear selection, placing protection, belaying, anchors, abseiling techniques both retrievable and not and more. I,ve already started to update my climbing rack. I think I,ve caught the climbing bug which is why I would like to take my skills to a higher level and book another session (With Catrin) the next few weeks or sooner. I really feel like I am improving and learning lots of new things. I really enjoyed climbing with Coen and Ashwin too. You'll be glad you didn't drive into Málaga on Sunday, traffic was a disaster with lots of roads closed but the bus was ok.
have him pass on tips about my climbing. L...and myself just want to say thank you to Rory and the team for helping us arrange this, we had a fab day.. Shame about the weather but you can't win them all! Thanks for a great couple of days. Really enjoyed the course and it was great to meet you. Please do keep me in mind for any further courses with other groups - you never know what I might be able to squeeze in around work and I would love to come back and do more. Have a lovely time in Morocco - hope your holiday is as good as mine's been! Just a quick note to say thanks so much for the weekend - we both really enjoyed it and hope to catch up with you again very soon. We just wanted to say once again, thank you for an incredible experience!! The Camino del Rey was all that we expected and so much more and we know it was in large part because we had you as our instructor. Also, a big, big thank you for arranging our stay in the beautiful town of Villanueva del Rosario. You were right, it was truly worth it to stay. And of course, please pass our thanks along to your friend who so graciously offered us his home. Kaileen and I both couldn't be happier with the entire experience. If we're ever in Spain or the UK and looking for more courses, we'll be sure to get in touch. We returned from Spain this weekend, and wanted to thank you again for our wonderful three days with you. We all really enjoyed your company and are very grateful to you for sharing some of your great skills, knowledge and experience with us. I am sure we will always remember it. Victoria is looking forward to getting back to the climbing club at school, where she will perhaps demonstrate some new-found confidence!! I just wanted to say hello and thank you again for 4 great days. I got back safely, last week was pretty crazy at work - but I feel still pretty relaxed ! Hope you had a nice Sunday afternoon with alot of climbing with Ale ? And a good week ... even if it was very busy. Just back from our holidays and thought I would let you know what a fantastic day Seb had with you. Many thanks for making his holiday perfect. He enjoyed both the climbing and bouldering and is busy telling all his friends at climbing all about it. We arrived home yesterday evening. Thanks for arranging our training, Rory was excellent. We met as arranged and Rory showed up spot on time. We all appreciated his friendly, easy going and professional manner. Rory's training methods worked really well for us. I particularly learn well with 'monkey see;monkey do'! We covered all that I hoped to and I am definitely now confident to take my sons out scrambling. We are all looking forward to increasing our experience. I have paid the rest of the money by paypal! we had a really good time, thanks a lot! We had a great time despite the weather on Saturday. Cat was an excellent instructor and I think she covered exacly what we wanted. Our intention now is to return to N. Wales and practice what we were taught. Just a quick line to say that we had a fantastic two days climbing with Pete. I've managed to retain some of your equipment - a small screw-gate karabiner and two prusick cords - which I will post on to you. Some pictures follow once we’ve downloaded them all and chosen the best (you took some really good ones- thank you!) but I wanted to write as soon as possible to thank you very much for two great days. It was exactly what we needed (even though I had not been sure quite what we needed beforehand) and you struck the perfect balance between making us feel comfortable enough to learn and then pushing us to do things we would not have attempted otherwise. I had not thought that anyone could have convinced me to step backwards off the edge of a bit of rock but you managed it – thank you! We have been practising our knots and are looking forward to our next day off when we can go in search of some (easy!) crags and try out our new techniques. We are also determined to brave the climbing wall. I wish to say thank's for a great days climbing. I was really delighted by the cliffs at south stack. Please thank Rory for making (it)such an easy climb(ing day). It was also my first trad climb which has made me feel I would like to try leading myself on a trad route. Who knows maybe I'll be back one day and take a few tips from yourself or Rory. Thanks again I really had a good time. Our thanks for excellent climbing - it proved great fun, instructional and hit the nail on the head for difficulty, height exposure etc for our group. Particular thanks also for your flexibility matching to the weather to hit a lovely sunny day. Hope you like this photo of you and KJ....Thank you so much for a wonderful experience. All three of us really enjoyed our day with Pete. It was so useful and what a fabulous guy he is. A great assessment of what we needed and delivered in such a great way with his gentle manner. The boys really liked him – and so did I. Definitely worthwhile. Please pass on our very best to Pete and feel free to use any of this to endorse your services. I will be recommending you to any of my contacts who are contemplating climbing in Wales without any hesitation. Thank you for a wonderful time on Saturday - and for the suggestion about mountain biking - we had a great time doing that on Sunday. And we jumped off the tree Monday morning - that was really scary and I had to be pushed! I can't believe it was only a few days ago - back to real life and it feels forever ago. Hi, The course was brilliant, we loved every minute! The equipment provided was of very good standard and there were loads of it!we both thought Will was a outstanding instructor, he was very informative and made us feel very safe. We would definitely enjoy climbing with will again sometime in the future! ........You were a FANTASTIC instructor. Thank you. i bought a GRIGRi and 5 quick draws last night when i got back from Malaga so am planning to try and get sport climbing this weekend! Thank you again and hopefully i will see you again for another course. .......We had a fabulous couple of days and the progress that we both made from significantly different starting points was great to witness. Cat was a fantastic tutor and delivered in a way that suited myself and Dean. At no point did we feel too out of our depth (just enough on the second day to ensure that we will always maintain huge respect for the climb and the importance of safety first!) and we remained reassured throughout the course that any difficulties could easily be resolved by Cats intervention...such is the calm and assured manner of her delivery. Cat delivered in a completely bespoke way which was exactly what we hoped would happen and the days were continually changing as cat reassessed our abilities and suggested a variety of climbs that would challenge us but would also excite us. We were able to select climbs for day 2 that gave us the options to try different rock, climb a classic or just embed skills with some supported top roping work. We both felt that having a female instructor worked in our favour as it removed that 'top dog'/'male ego' challenge environment that can be created in a male group and instead we were able to work co-operatively and hit our course objectives in an effective, safe yet challenging way. I must also thank you for your continuous promptness on e-mails and your work in identifying us such a good instructor. This follow up e-mail just confirms in my mind how professional your company is and I would not hesitate to recommend you, the rock climbing company and also Cat to any people who are interested in developing their 'outdoor skills'. just wanted to say we had a great day with pete (and will), they were really excellent and totally tailored the day to our requests. we covered loads and did some great climbing. can't wait to visit again. thanks again for the great week! I think I really made considerable progress and, even more important, had lots of fun. ........ I’d just like to reiterate what we said in Spain. We found your instruction to be utterly professional with a meticulous eye to detail. The four of us both learned a tremendous amount and thoroughly enjoyed ourselves. I must bring tape and super glue to repair fingers next time! Thanks so much for a fantastic week, for all your encouragement and expertise, and also for the lovely chats at the crag and for showing me your beautiful area. I have learned such a lot, and climbed some hard grades... for me! You've been a great companion too. I cant wait to get outside again and put everything into practice. "Many Thanks" again for a great week. so much to remember and good fun, I was quite nervous and apprehensive when I arrived wondering if I had made a mistake...but it turned out to be excellent, really enjoyed it. I’ve been putting off contacting you for a while as I know you said you get lots of emails and I know it takes a lot of time to plan your schedule etc. I wanted to say thank you for all your help on the course and for parting with your experience. I enjoyed it very much and I’m focusing on putting a lot of it into practice this year. I would like to come another week (5 days) in december. Is that possible and what week/time could that be, if so? Wanted to drop you a quick note to say thanks for a great week climbing. My objective of gaining confidence to independently climb outdoors was more than met. Well done on completing Golpe de calor – what a great route. Since I left Spain training and climbing has been going well. I successfully completed the CWA assessment last week and flashed a 7a at the Westview wall in Preston. I’m just starting the next 3 week phase of maximum strength training having concentrated on doing lots of long routes at Stockport and other walls to improve stamina throughout November. Footwork and resting has definitely improved. I had a great time in Spain – thanks again. So, next year we want to come and do a 2 day outdoor/lead climbing course, with yourself, so we can start doing some trad routes. When do you start your course's in wales next year? LB - Rebooking for 2010 after a course in 2009. I just want to pass on a HUGE thank you for a fantastic day! Paul was really impressed by the experience and has left him hungry for more! I want to also stress how brilliant Alun was too, we raved about him the whole way home...he was informative, patient, gave really good advice and generally a fab instructor...so thank you Alun! Also thanks for endeavouring to give Paul a great experience and the 'hard climb' he so persistently wanted once he got a little more confident towards the end of the day...I know it was a tricky situation when all the other climbers had nabbed the hot spots, but with diligence you found the perfect spot for our last climb, and he really appreciated that...so thank you so much! I did want to express my profound thanks for your help and support in helping me achieve a ten year long ambition to walk Crib Goch....throughout you were extremely kind patient and encouraging yet firm when required.... I do not believe that I could have done it without your knowledge, skill, support and experience....I hope and believe I will meet you again on one of your courses. Hope you had a great weekend and made it to Spain! could you pass on our thanks to Martin and Darren for an amazing and memorable day - enjoyed by all. Thanks. I'm sure we'll be back for more. I am sorry that it has taken me weeks to send you this email. I have thought of you often since my return home and have wanted to tell you how very much I appreciated our time together. You are a fabulous guide for not only climbing, but also for living life. I feel that it’s been a blessing to know you, to learn climbing with you, to laugh together. It was a great time! Gracias otra vez por un dia fantastico de escalada! Te mando 2 fotos de tu que son buenas. Suerte en todo, y llamame cuando vienes a los EEUU para escalar. I just wanted to say what a wonderful time the girls and I had last week with climbing and abseiling. I appreciate we were spoiled with having 2 instructors to the 3 of us, however, we had a great time. Please pass on our thanks to the guys, they were very patient, extremely helpful and their instructions were really clear (very helpful with 2 girls under 10 that rarely listen to their mum! ), no doubt we'll be back again next year, although my daughters now have the climbing bug! A late note to thank you both and say that me and the boys had a wonderful time last week and thoroughly enjoyed our climb. I hope to see you next year for another session. We had a fantastic time on our two day scrambling course with you in July....Our via ferrata holiday in Italy is early September and I feel that I need another day with instruction...... I would be really grateful if you could help us out in any way. I left a message on your answerphone, but just in case you don't get it ... Thank you for a wonderful couple of days. We had a really good time both walking with Martin and doing the climbing work with Tom. We will definitely recommend it! Just like to say thank you again for a fantastic weekend, it was great to meet and learn from you. We both came away feeling energised and excited, and we look forward to putting into practice everything we have learned (except how to get out of trouble) Julie found the climbs on Holyhead a little scary, and thanks to your constant encouragement and help was able to complete them. All sports should have a Silvia to help and encourage new comers, and promote their sports with enthusiasm and passion. I hope to travel to Spain in Oct 2009 to attend an improvers course, I am very interested in technique, being small it is essential to move to higher levels. Look forward to meeting you again, thank you very much for your patients (sic) and guidance. some time... Thanks too for being photographer as well!